Interesting how books written by an inspiring author can make you contemplate aspects of your own faith, but that’s exactly what Mitch Albom’s books can do. 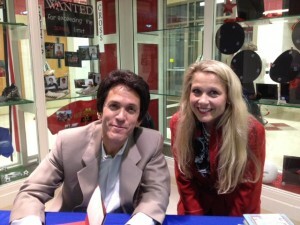 Albom’s genre was originally sports-related, but he skyrocketed to literary celebrity in the late 1990s with his bestselling, Tuesdays with Morrie, followed by The Five People You Meet in Heaven, and For One More Day. My personal favorite was always his 2009 non-fiction, Have a Little Faith, about a dying rabbi and an inner city pastor. Yet, his 2018 release, The Next Person You Meet in Heaven, might be my new personal favorite. Let’s just say I was sobbing into my tissues at the end of the book, but it was one of those cathartic ugly cries women live for. Although Tuesdays with Morrie is probably Albom’s best known work. It has become a modern classic and continues to sustain popularity with over half a million followers on Facebook alone. Probably because the book addresses human mortality, one of the most challenging and perplexing issues that we all must face. Confronting death head-on in, Tuesdays with Morrie, Albom interviewed an elderly Morrie Schwartz, who was dying of Lou Gehrig’s disease. In one chapter, the Detroit Free Press columnist quotes Morrie as saying people don’t talk about death, because “no one really believes they are going to die.” But none of us is getting out of here alive unless theology-permitting, the Rapture happens first, because the Bible tells us that our human bodies are wearing out on a daily basis. For some reason, even though death is all around us, it still comes as quite a shock when it happens in our circle. To explain, when we learn of someone close who loses their child or mate, it’s easy to experience guilt for the gratitude we feel that the tragedy happened to them, instead of to us. We hug our own spouses and kids a little tighter, hoping to stave off this inevitable grim reaper. I was just one of the folks interviewed by Ms. Stache for the 1997 suicide prevention piece that aired nationwide and in Europe. I shared my testimony of surviving several near fatal suicide attempts as a young woman. Later, I would tell this story over and over in schools, prisons, and churches. It was not the “wanting to die” part, but rather the “grateful that I’m still here” message that I shared. My goal was to offer a glimmer of hope that with God’s help there is always a reason to live. Still it was Jewish Holocaust survivor, Elizabeth Bing Sondheimer who exposed the truth about my passion to spare others from suicide. She spotted my surivivor’s guilt almost immediately after first meeting me. This wise mentor gently guided me in relinquishing the guilt of surviving when others had not. She, too, lived with this same dilemma losing most of her extended family to Hitler’s diabolical genocide. Liesl taught me renewed awe and gratitude for the gift of life, while finally accepting my purpose birthed through the pain of loss. After all, suicide is a lot like cancer, without intervention one’s irrational thoughts can result in a tragic decision. When our mental health is jeopardized, the darkness and hopelessness close in, creating despair. This is a time when a hurting person needs help, because it’s never our choice to decide whether life is worth living. The Bible tells us, “You realize, don’t you, that you are the temple of God, and God himself is present in you?” (I Cor.3:16) Then there’s also, “Or didn’t you realize that your body is a sacred place, the place of the Holy Spirit? Don’t you see that you can’t live however you please, squandering what God paid such a high price for…” (I Cor 6:19) The high price that God paid for each one of us was himself dying a painful and humiliating death on a cross. Jesus died for us to give us what Scripture says should be an “abundant” life. When life gets rocky, we have to remember that God is still in control. Yet that’s difficult to do when you’re elderly and alone, middle-aged and unemployed, or a troubled teenager like I once was. Sadly, suicide is the third leading cause of death for teens. Nationwide elderly males are at great risk, too. The use of drugs or alcohol also increases the propensity towards suicide. As believers, we can offer assistance to others struggling by being, “Christ with some skin on.” We can pray, listen, and destigmatize mental health issues by encouraging those battling illnesses like depression and addiction to seek professional help. Suicide is never a solution. Life is always worth living. If you or someone you love needs help, please talk to a concerned pastor, counselor, or call the National Suicide Prevention Lifeline at 1-800-273-TALK (8255) or click on the logo to visit their Website. Christina Ryan Claypool is an Amy Award winning freelance journalist and Christian speaker. Her book, Seeds of Hope for Survivors is available through her Website at www.christinaryanclaypool.com. This entry was posted in A Spiritual Path: On the Road Less Traveled by Christina Ryan Claypool. Bookmark the permalink.